What do you identify as (gay, bi, transgendered, queer – use any terms you like here)? Transman – and not just because am a pre-op female-to-male transsexual. Say, 5 – 10 years down the line, when (and if!) am through with all the surgical procedures, I will still call myself a Transman. When did you first start to define your identity as such? Technically, about 6 years ago, through a dear friend (a Transman himself), after a 3 year long journey of trying to ‘fit-in’ as a lesbian, and continual pondering about ‘what is it that is missing?’ I was new to the group, and very new to the queer world, so had no clue whom to ask. It all exploded the night I finally got lucky to go to bed with a woman, and she left within the first two minutes, screaming “OMG! You are so DAMN straight! !” That was it. I knew I needed help, asked for it… and was put in touch with this friend (who, he revealed later, was told to figure me out! )… And so he did! I felt I’ve come home!! Have you experienced first-hand trans/homophobia? If yes, how did you deal with it? Rarely! And, I was very young then (about 7 – 8), so had no clue what am going through is, actually, transphobia. I never liked wearing skirts as school uniforms (unexplained then, makes perfect sense now! ), and, thanks to my ‘teacher’s pet’ behaviour, I was the only ‘girl’ in the school with the privilege of wearing trousers as uniform. The boys in my class somehow didn’t like it, and used to play some real sad tricks! Once they stopped me after school, and told me that I am not a girl, but a ‘hijra’, and they will call up the ‘hijra’ community to come and take me away, and that I will not be allowed to stay at my home after that! The very thought scared the s*** out of me! Sadly, in these small towns like the one I come from, the ‘hijra’ community is still a taboo, especially among children. Hope that changes soon. Amen! When did you first out yourself? Was it unplanned or was there careful planning involved? Absolutely unplanned! I took her out to lunch, and was quiet as dead for the first few minutes… not because of hesitation or something, but because I forgot the full form of GID (that’s Gender Identity Dysphoria, by the way). Who did you come out to & why did you come out to that person? It was Nishtha – a dear friend, colleague, and eventual flatmate. There were a couple of factors besides the general restlessness to share the excitement of FINALLY figuring out ‘where’ I belonged in the spectrum! I had been reading a lot on Transsexualism, and wanted to talk about it to someone new to the term, and get a fresh perspective on this newest term in my dictionary that had begun defining me! A rational, objective person like Nishtha was, undoubtedly, my best bet. And lastly, a new girl had joined office that very day. I caught a glimpse of her, and WHOAA!! !… Couldn’t take my eyes off the door she went through! I wanted Nishtha to ask her name (because I was too scared to ask myself! )… Sounds filmy I know, but I was only 20! I knew she would ask “why?” and I can’t boast of my lying abilities, even in my ‘most confident’ spirits! How did that person react? However, once answered satisfactorily, she welcomed it open heartedly, and discussed at length on what should be the next course of action! Of course, she introduced me to the new girl and told her about my gender identity the very next day! I almost threw up all the noodles stuffed in my mouth! Did your coming out change anything about your relationship with them? Oh yes! We became much better friends. Besides, she began confiding in me after this, and both of us stood by each other, irrespective of the circumstances, thus, drilling this ‘I am not alone!’ feeling so deep inside our hearts that till today, whenever I stand up for what I feel, I can literally feel her “attaa boy!” tap on my shoulder! Have you ever been outed without your consent? If yes, how did you deal with it? For some reason, I always end up outing myself within the first month of joining any new place. Guess it’s more to do with the fact that though the people you professionally interact with do not necessarily need to know who you sleep with and therefore sexuality, they definitely need to know how to address you! Since language itself is so gendered, one can’t escape coming out at workplaces – unless, of course, one can handle being addressed in the wrong gender for almost 80% of the time spent with open eyes! So, outing without my consent is a very rare thing for me. Having said that, it did happen once! A colleague of mine, at this place I had joined just three days before it happened, had figured it out himself by looking at ‘rakhis’ on my wrist. He asked a direct question, and got a direct ‘yes’! Next thing I know, he wrote a mail to the Director about allotting batches, and addressed me as ‘Mridul’ and ‘he’ (since all my papers are in my formal name and designated gender, that’s how all my new employers always begin knowing me). The Director just asked a handful of questions about how comfortable I would be, getting officially addressed as Mridul and Sir (by students), and when he saw me confident – he just sent out a mail telling everyone about my decision and that he expected matured cooperation from all! How did the people you were outed to deal with it? Oh… They were all amazing! There were a lot of questions at first, but a mail from CEO was more than enough to, at least, make them willing to listen! Anyways, all these initial apprehensions never last for very long. Once they get to know you for who you are, what you do, and how well you do it, they start seeing you for the person you are, and everything else becomes immaterial. In case of a problem, it’s never too hard to seek help. This is one good thing the “Consider workforce Human Resource” culture of companies has done for us. They will exploit you, but they won’t let you rot! 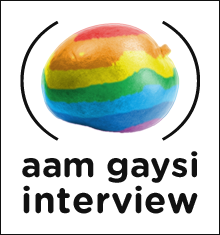 Do you think being gaysi makes it harder to come out & that if you weren’t part of such a traditional & conservative culture you would have an easier time with your sexuality/identity? Honestly, I think otherwise! Being a Gaysi has actually helped me have an easier time. Since the common folk is getting to know all these dynamics of gender/sexuality fluidities for the first time in the open, it’s like writing on a blank slate – which is always the easiest! For instance, today, am out to at least 300 – 400 colleagues/ex-colleagues, and about more than a 1000 students have no clue about my physical gender! It’s like living my desired gender role without even having to go through any medical procedures! Ask any Transperson, and that is surely a dream come true!! When I think of it, living anywhere else (where everyone just knows it all) would have only made things difficult. Considering the minority we are in (F2Ms in particular), their acceptance of me (especially at work!) would have, to a large extent, depended on their last experience with a Transman (either at work, or outside – generalisation comes easier than objectivity!). Needless to say, since we are just in the beginning, it requires sincere/mature efforts to have them, one, understand us correct, and, two, remember us for the right reasons. Right information at the right time serves the key, and platforms like Gaysi definitely deserve a special mention/applaud for providing the same. Would you recommend that people stay in the closet or come out? The world sees us through our eyes (topped with a magnifying glass)! So, if we have even the slightest doubt about who/what we are, or that what we do/how we live is not as ‘normal’ and unquestionable as the Sun rising from the east… those doubts will come back to us manifold. So come out when you are sure!! Have you come out to any family member? All of them, except my brother, and his wife – and that too because we don’t share a great relationship for several reasons. Everyone is more than just fine with it. Mom calls me ‘beta’ (son) and sisters tie me Rakhis. One Bollywood actor/actress you would love to see coming out as gaysi? Sushmita Sen, and Nandita Das! If you could magically go back to being non-queer, would you do it? Why or Why not? Not even in my wildest dreams! Where else would I have got to live the nuances of the two extremes of the gender spectrum, and also of those intermingling shades in between? I really feel being queer has made me a much better person than I would have been otherwise. So, no way! I love Mridul! Lovely interview! High five Dude! Welcome to the party. I admire your courage in getting out and being out at your workplace. Hats off Mridul! 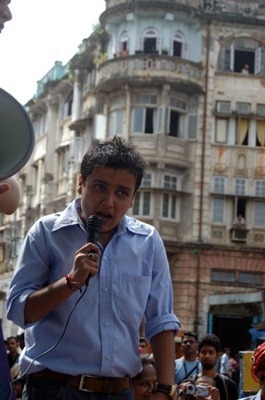 Folks like Mridul are a great inspiration for the Indian queer community. Hats off! I am also very impressed by Mridul’s boss who made sure Mridul was treated with respect at the work place. That is simply awesome! @ Mridul : All the very best dude! @ Shri – yeah, that boss of mine has always been a sweetheart! @ MJ – m so so so glad we did this interview! 🙂 Thanks!!! 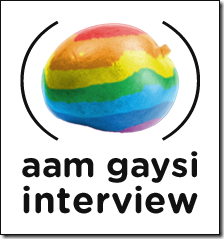 Previous post Should Bollywood Support the LGBT Community ?